The “People, Process, Technology” trinity has been a long standing framework that has helped companies to focus on their mission, structure, and growth for decades. Time and again, it has proven to be a fail safe starting point for determining who you are, what you do, and how you do it. 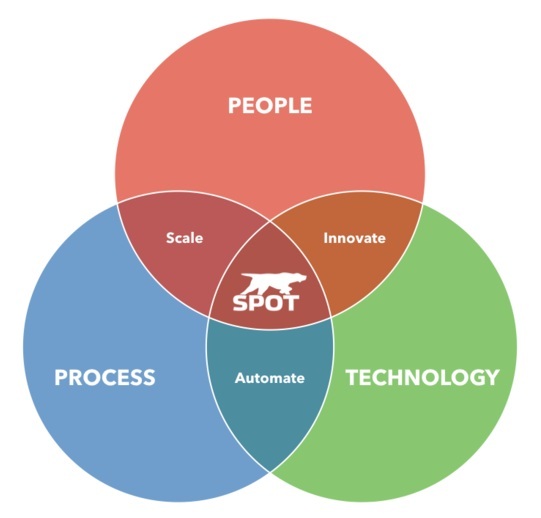 At SPOT, we make it a point to take occasional steps back in order to revaluate and ensure that we are staying focused on our clients, product, and overall mission as a company. Here’s an inside look at how we make sure we’re staying the course. One of SPOT’s greatest distinctive characteristics is our process. SPOT’s process is driven by an awareness that time is money, so the more time we can help our customer’s save while collecting data, the more projects we empower them to complete. How do we do that? By creating a single data stream through the development of one of the most comprehensive apps on the market. Clean, user friendly, and capable of continually gathering data even when offline, the SPOT app categorizes and houses more data than any other similar application. Our process is why we exist: to bring today’s technology into a cohesive relationship with customer’s informational needs while ensuring total compliance. While the technological component seems like it would be the most complicated, it really answers the simplest question: how can we do more, faster? Through the creation of the SPOT app and our all weather jeepable barcodes, we have been able to compile more information in less time, with fewer people, at more touchpoints than any other competitor. By answering the question of what would create the greatest efficiency, we were able determine that an app could collect more data while needing fewer users, allowing the information not only to be uninterrupted, but collected in a single database that is accessible at any time, from anywhere. The result? A more complete data stream that allows you to track your materials and assets from point of purchase to installation and audit, delivering not only compliance, but peace of mind.